Bij aanschaf van dit product krijgt u in totaal 26 Loyaliteit punten. Uw winkelwagen bevat een totaal aan 26 punten die omgezet kunnen worden in een waardebon van 1,30 €. Japan is truly timeless, a place where ancient traditions are fused with modern life as if it were the most natural thing in the world.Explore a bamboo grove in Arashiyama, marvel at Shinto and Buddhist architecture in Kyoto, or relax in the hot springs of Noboribetsu Onsen; all with your trusted travel companion. 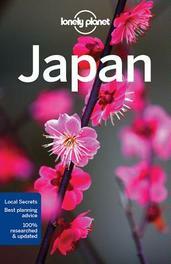 Get to the heart of Japan and begin your journey now! Cultural insights give you a richer, more rewarding travel experience - history, festivals, hiking, onsen, cuisine, architecture, sport, traditional accommodation, geisha, visual arts, performing arts, literature, music, environment, cinema. Free, convenient pull-out Tokyo map (included in print version), plus over 140 maps. Coverage Includes: Tokyo, Mt Fuji, Nikko, Narita, Kamakura, Hakone, Nagoya, Gifu, Kanazawa, Nagano, Kyoto, Kansai, Hiroshima, Okayama, Osaka, Kobe, Nara, Matsue, Sapporo, Shikoku, Tokushima, Fukuoka, Okinawa and more.